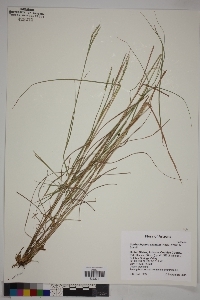 Schizachyrium cirratum (Hack.) Wooton & Standl. Plants cespitose or shortly rhizomatous. Culms 31-75 cm, often decumbent, not rooting or branching at the lower nodes, glabrous, glaucous, sometimes purplish. Ligules 1-2.5 mm; blades 6-17 cm long, 2-4 mm wide, glabrous, without a longitudinal stripe of white, spongy tissue. Rames 4-6 cm, usually exerted, straight, often somewhat stiff, not flexuous, appearing linear; internodes straight, with a tuft of hairs near the base, elsewhere glabrous or ciliate on the margins. Sessile spikelets 8-10 mm; calluses 0.3-0.6 mm, hairs 0.5-1.2 mm; glumes glabrous or scabrous; awns 13-24 mm. Pedicels 3.5-5 mm long, 0.2-0.5 mm wide at the base, widening to 0.5-1 mm, straight, with a tuft of hairs at the base, distal 1/2 usually ciliate on 1 side, sometimes on both sides. Pedicellate spikelets 6-8 mm, about as long as the sessile spikelets, usually staminate, sometimes sterile, unawned. 2n = 20 (for var. cirratum). Schizachyrium cirratum grows on rocky slopes, mostly at elevations of 5000 feet or higher, from southern California to western Texas into Mexico, and is known from South America. It is an excellent forage grass. Plants in the Flora region differ from those in central Mexico in being essentially non-rhizomatous and in having glabrous rame axes and pedicels that are ciliate only on the distal half. Perennials, Terrestrial, n ot aquatic, Rhizomes present, Rhizome short and compact, stems close, Stems nodes swollen or brittle, Stems geniculate, decumbent, or lax, sometimes rooting at nodes, Stems caespitose, tufted, or clustered, Stems terete, round in cross section, or polygonal, Stem internodes solid or spongy, Stems with inflorescence less than 1 m tall, Stems, culms, or scapes exceeding basal leaves, Leaves mostly cauline, Leaves conspicuously 2-ranked, distichous, Leaves sheathing at base, Leaf sheath mostly open, or loose, Leaf sheath smooth, glabrous, Leaf sheath and blade differentiated, Leaf blades linear, Leaf blades very narrow or filiform, less than 2 mm wide, Leaf blades 2-10 mm wide, Leaf blade margins folded, involute, or conduplicate, Leaf blades mostly glabrous, Leaf blades glaucous, blue-green, or grey, or with white glands, Ligule present, Ligule an unfringed eciliate membrane, Inflorescence terminal, Inflorescence lateral or axillary, Inflorescence with 2 or more spikes, fasci cles, glomerules, heads, or clusters per culm, Inflorescence single raceme, fascicle or spike, Flowers bisexual, Spikelets pedicellate, Spikelets sessile or subsessile, Spikelets laterally compressed, Inflorescence or spikelets partially hidden in leaf sheaths, subtended by spatheole, Spikelet less than 3 mm wide, Spikelets with 1 fertile floret, Spikelets with 2 florets, Spikelets paired at rachis nodes, Spikelets in paired units, 1 sessile, 1 pedicellate, Pedicellate spikelet rudimentary or absent, usually sterile, Spikelets bisexual, Spikelets disarticulating below the glumes, Spikelets falling with parts of disarticulating rachis or pedicel, Rachilla or pedicel glabrous, Glumes present, empty bracts, Glumes 2 clearly present, Glumes equal or subequal, Glumes equal to or longer than adjacent lemma, Glume equal to or longer than spikelet, Glumes keeled or winged, Lemmas thin, chartaceous, hyaline, cartilaginous, or membranous, Lemma 1 nerved, Lemma glabrous, Lemma apex de ntate, 2-fid, Lemma distinctly awned, more than 2-3 mm, Lemma with 1 awn, Lemma awn 1-2 cm long, Lemma awn from sinus of bifid apex, Lemma awn twisted, spirally coiled at base, like a corkscrew, Lemma awn once geniculate, bent once, Lemma margins thin, lying flat, Lemma straight, Stamens 3, Styles 2-fid, deeply 2-branched, Stigmas 2, Fruit - caryopsis.